The beauty of online bingo is that you can play wherever you want to. Kick back and relax at home on the sofa with a cup of tea, the soaps and your laptop. Unlock your phone on the go or on your way to work and have a quick round of bingo, the opportunities really are endless. Online bingo is a 24/7 game, unlike normal bingo halls where you have to go to a certain time slot or on a certain night. There will always be games available to play online, whether you fancy a game of 95 ball or 75 ball, Pink Casino will always be here to play. As we said earlier, online bingo is a 24/7 game, but that doesn’t mean that you have to be there to play it. Unlike traditional Bingo, you can actually buy your tickets in advance for the games. Buying your ticket for a game in advance means that not only do you have a guaranteed place in the game, but the game can also be played automatically for you, so really you don’t have to do anything! Going out to a traditional bingo hall can be a good idea, however, sometimes that just isn’t what we want to do or some people don’t even have access to a Bingo Hall! If you don’t fancy leaving the house and heading to the Bingo then you can play an online version of the game in your own home. Unlike traditional bingo rooms, online casinos often use bonuses. While joining sites, players are often given the option to pick from welcome bonuses or first deposit bonuses. Not only that, players will often receive additional bonuses over email or their chosen form of communication. We have lots of promotions on at Pink Casino, head over to our Promotions page to take a look at them. Many people think that because you are playing online bingo in your own home that it will lack the social aspect, however here at Pink Casino alone we have had nearly 2500 unique players in the last 6 months. The chat rooms are great places to meet new and like-minded people. Not only will you be able to chat with players from your country, but with players all around the world. 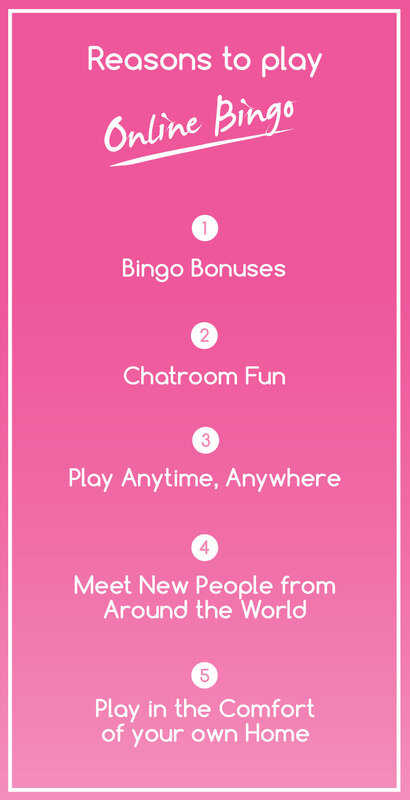 Also while playing online bingo, the bingo chat host will interact with the players in the chat room, asking them questions and playing games to keep everyone involved. Playing bingo online means that you can choose the amount that you wish to play with. There are different online bingo rooms with different values that you can use, meaning you can play with any value that you wish. So now you’re interested in online bingo and you’ve joined up to a site, then it is time to look at which game you want to play! This is the most popular bingo gam across the UK and also on Pink Casino. The tickets to this game are made up of a 3x9 chart of numbers with each line of the 9 boxes having 5 numbers with 4 empty spots. The numbers called out are between 1 and 90. This bingo style tends to be the most popular across the globe and more specifically the United States. Rather than a 3x9 grid, a 75 ball bingo game is played on a 5x5 grid and has balls ranging from 1 to 75. Speed Bingo is basically what it says on the tin, it is a variation of a classic game of bingo but is played at a much faster rate than the usual game. The average Speed Bingo game is only 30 seconds long, making it the ideal game for players who are in a rush. Unlike the above games, speed bingo only uses 30 balls, which makes for a quicker game. The Daily Pre Buy Bingo is a game that is played every night at 9pm, the bonus with this is that you can buy your tickets up to a week in advance. The Daily Drop Bingo has a jackpot of £500 every day! Fancy your chances at winning £1000? Then why not pre buy your ticket to the Grab a Grand bingo room? With this game you don’t even have to be online to play. We hope that you enjoyed our guide to online bingo, although it’s only brief, we’re sure it will give you an insight in to the game and all of the reasons why you should give it a chance. Why not head to our Bingo page to give one of the above games a go and see if you enjoy it like our other Pink Peeps!